From the same production team that brought us Puttin' On The Ritz (which you can see my review for by clicking here), That's Entertainment again adheres to the format of showcasing the most memorable musical hits from the mid-20th century - and the show does a very good job of rekindling fond memories for the older generation and introducing a younger audience to these classic songs. That's Entertainment is enhanced by the involvement of The Overtones, who have firmly established themselves as one of the UK's leading vocal harmony groups. Whilst the other singers perform to a high standard, it is The Overtones who many theatregoers will head over to the Empire Theatre to see, and based on this showing, those spectators won't be disappointed: The Overtones provide unique and powerful renditions of some very popular songs, amongst them Runaround Sue, Can't Take My Eyes Off You and Give Me Just A Little More Time. The already-strong performances take a step up whenever The Overtones are on the stage, and those impressed will certainly be looking to see them when they go back on their own tour in the near future. That being said, this tribute to 1940s and 1950s music wasn't just about highlighting The Overtones: there were talented performances across the board. Simon Schofield acted both as the host and the leading (non-Overtone) singer, and his vocal range was clear through a range of songs which ranged from the toe-tapping numbers to the slower and softer tunes to the catchy dance hits that had the audience clapping around. Loula Geater, Sean Smith and Emma Kate Nelson also demonstrated their musical talents, and based solely on the strength of the musical performances, the show didn't have a single dull moment. As for the songs: those who are familiar with the leading hits of the pre-Beatles era will recognise plenty of tunes here. They included Good Morning, It's A Long Way To Tipperary, Puttin' On The Ritz (fitting, given that this was their previous show), We're In The Money, Get Happy and I Got Rhythm. There were also collections dedicated to Rodgers and Hammerstein (which included Some Enchanted Evening and There Is Nothing Like A Dame) and a section paying tribute to the legendary Rat Pack of Frank Sinatra, Dean Martin and Sammy Davis Jr. (this portion included Ain't That A Kick and That's Life). Perhaps the musical highlight was the pre-intermission group rendition of You'll Never Walk Alone, which of course went down well in this Liverpool setting (especially for me, since I am a die-hard Red myself!). That being said, it was very well performed, although those with extensive musical knowledge will appreciate that this performance was not of the Gerry & The Pacemakers cover, but of the original version seen in Carousel. The words are the same, but the tones and the tunes are very different; watch this show and you'll understand. Either way, it was very good. Other thoughts: I thought that the backdrops for the performances (a range of American nightclubs for Act 1, and a more intimate club stage setting for Act 2) were very colourful and exciting, and ensured that one's eye never drifted from the activity on stage. The dance moves were well-performed throughout, some by the singers and some by the large and very talented ensemble of dance performers employed for this production. The costumes were suitably stylish and tailored to the mid-20th century era of music (suits and hats for the male singers during the Rat Pack scenes, tuxedos and posh evening gowns for the early scenes featuring catchier dance numbers etc). And as a longtime Simpsons fan, I couldn't help but notice just how many of these famous tunes have been referenced in that series at some point, which raised a smile (I counted at least five, but there were probably more). I did think that the show finished a little early (and without a traditional "extra" tune at the end, which might actually be a good thing given how often it occurs in most productions), and the lack of a true story thread may make it a little less appealing for those who are debating whether to attend; however, that is not even an issue once you sit down and watch the show. Overall, then, I would give a strong recommendation for That's Entertainment. The older generation will love being able to relive fond musical memories, the younger audience will receive a valuable education on what genuinely good songs are, and for both groups, the vocal range of musical talents and the sheer quality of the performances, both from a singing and dancing perspective, is a joy to behold. Plus, you get The Overtones as an added bonus! 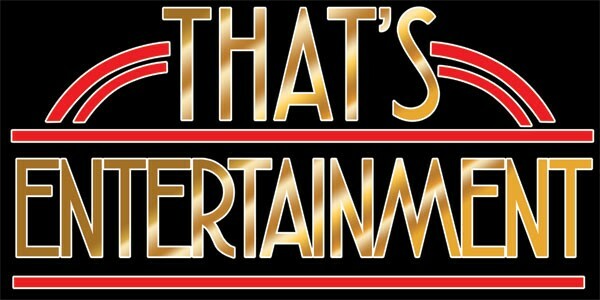 That's Entertainment lives up to its name by providing a very enjoyable show, and a fun look back at what was a great era for music.